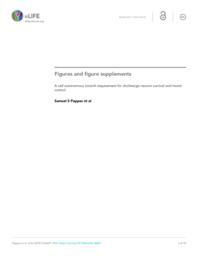 Cholinergic dysfunction is strongly implicated in dystonia pathophysiology. Previously (Pappas et al., 2015;4:e08352), we reported that Dlx5/6-Cre mediated forebrain deletion of the DYT1 dystonia protein torsinA (Dlx-CKO) causes abnormal twisting and selective degeneration of dorsal striatal cholinergic interneurons (ChI) (Pappas et al., 2015). A central question raised by that work is whether the ChI loss is cell autonomous or requires torsinA loss from neurons synaptically connected to ChIs. Here, we addressed this question by using ChAT-Cre mice to conditionally delete torsinA from cholinergic neurons (‘ChAT-CKO’). ChAT-CKO mice phenocopy the Dlx-CKO phenotype of selective dorsal striatal ChI loss and identify an essential requirement for torsinA in brainstem and spinal cholinergic neurons. ChAT-CKO mice are tremulous, weak, and exhibit trunk twisting and postural abnormalities. 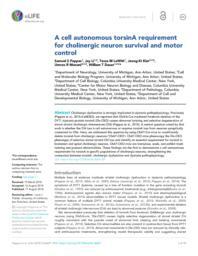 These findings are the first to demonstrate a cell autonomous requirement for torsinA in specific populations of cholinergic neurons, strengthening the connection between torsinA, cholinergic dysfunction and dystonia pathophysiology.